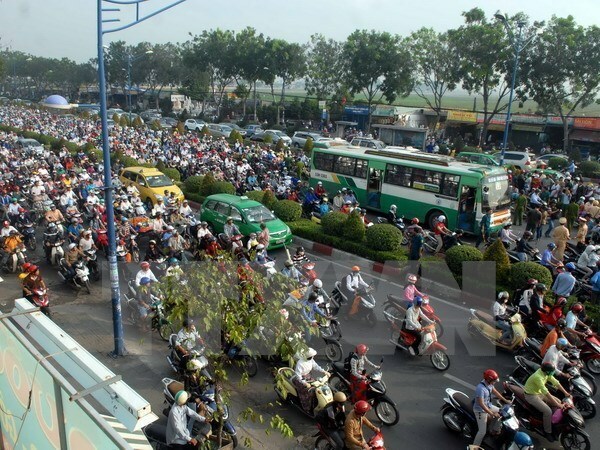 Hanoi (VNA) – Limiting personal transport means is suggested an urgent solution for Hanoi to tackling congestion, which is mainly caused by the mismatch between the poor infrastructure and the boom of individual vehicles. The capital’s streets and roads are being frequented by more than 5 million motorbikes in a fierce competition with half a million cars. The situation is forecast to get worse in years to come as it is estimated that some 11 million motorbikes will flood the capital by 2025. Meanwhile, the city has zoned only 10 percent of its urban land for transport, a far cry from 20-26 percent set in the locality’s transport planning, raising a fear for overloaded transport infrastructure, not to mention environmental impacts. Given this, the Prime Minister has assigned Hanoi, along with Ho Chi Minh City, to build roadmaps on creating motorbike-free streets in city centres, the official noted. According to Director of the municipal Transport Department Vu Van Vien, Hanoi’s road map aims to ban motorbikes in the city inner area within the next ten years. In December 2015, the municipal People’s Council approved a resolution on a target programme to reduce traffic jams during the 2016-2020 period. The programme is estimated to cost Hanoi nearly 2.2 trillion VND (99 million USD), targeting to ease traffic jams in at least 40 “hot spots” and reduce traffic accidents from 5-10 percent in terms of the numbers of cases, deaths and injuries. Vien said that public transport is projected to meet 20 percent of local travel demands by 2020. The figure is expected to increase to 30-40 percent in the next five years. Experts suggested that Hanoi should create policy-related breakthroughs, firstly financial policies, in order to lure more resources for transport infrastructure while seeking comprehensive transport management.